The answer is, of course, yes - and I'm going to give a quick trick for doing this using functions from the packages phytools (my package, of course) and ape. Here I go. 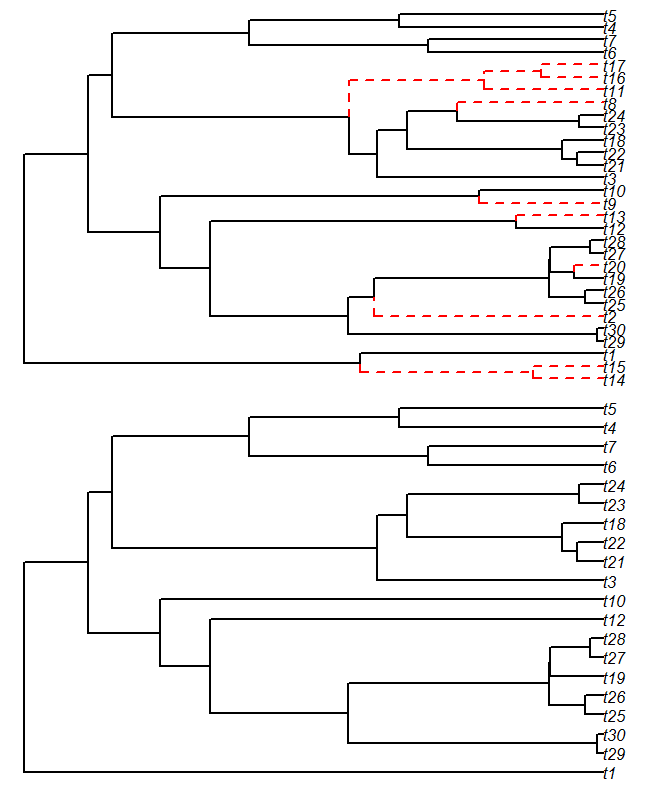 For the purposes of illustration, I will use a simulated, 30-taxon ultrametric tree; and a random set of ten tips. Pretty cool! The way this works is by identifying and then imperceptibly shortening the terminal edges leading to species that we plan to drop from the tree. We can then use the phytools function fancyTree(...,type="extinction") to automatically detect these species (as well as any internal branches leading to these species) as "extinct." It then plots all these edges with red dashed lines, instead of the standard black. (We could modify these color scheme - but as of now we'd have to change the function code). That's it! Thanks for the suggestion.